Mr. Jesse James Wood, age 83 of Bowdon, Georgia, passed away on Sunday morning, November 25, 2018. He was born October 23, 1935 in Carroll County, Georgia, the son of the late John W. Wood, Sr. and the late Effie Maxwell Wood. 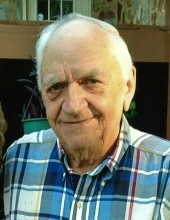 In his working career, he was employed as a mechanic with Holmes Dodge and John Deere Tractor dealership and New Holland Tractor dealership, and retired as owner of West Georgia Equipment Company. In addition to his parents, he was preceded by his wife, Mary Ann Hammond Wood; brothers: Elbert Wood and Reece Wood; and sisters: Dura Spruill, Nellie Jean Smith, Nora Wood, and Clara Sticher. Survivors include his children: Tony James Wood and Delores Diane Bell, both of Bowdon, Georgia, Rickey Lee Wood, and his wife, Jenita Lynn Wood, of Rising Fawn, Georgia, and Timothy Mark Wood of Bremen, Georgia; sisters: Myrtle Cook and Geneva Bradley; brothers: J. W. Wood and Oscar Wood; grandchildren: Crystal Marie Richards of Bowdon, Georgia, Casey Lee Wood of Sharpsburg, Georgia, Andrew James Wood of Athens, Georgia, Troy Jesse Bell of Carrollton, Georgia, Ashley Lynn Hallman (Wood) of Rising Fawn, Georgia, Brandy Nicole Wood of Dothan, Alabama, Zac Bell of Carrollton, Georgia, and Dylan Dakota Wood of Bremen, Georgia; and ten great grandchildren. Funeral services will be conducted Tuesday, November 27, 2018 at 2:00 PM from Martin & Hightower Heritage Chapel with Minister Milford Ballenger officiating. The following gentlemen will serve as pallbearers: Casey Wood, Austin Glover, Troy Jesse Bell, Zac Bell, Dylan Wood, Benny Hallman, Randall Sticher, and Andrew Wood. Interment will follow in Carroll Memory Gardens. The family will receive friends at the funeral home on Monday evening from 5:00 PM until 8:00 PM. Messages of condolence may be sent to the family at www.martin-hightower.com. Martin & Hightower Heritage Chapel has charge of the arrangements. To send flowers or a remembrance gift to the family of Jesse James Wood, please visit our Tribute Store. "Email Address" would like to share the life celebration of Jesse James Wood. Click on the "link" to go to share a favorite memory or leave a condolence message for the family.